SAP BW Data Modeling is needed in the following scenario.You need to evaluate all the available modeling options to find out how you can best maximize system performance and meet the complex demands that your company makes on historical reporting.You must consider many different options, including combined InfoCubes. A RemoteCube is an InfoCube, whose transaction data is managed externally instead of in the Business Information Warehouse. Only the structure of the RemoteCube is determined in the BW. A BAPI from a second SAP system or from a non-SAP system is used to read the data for reporting. A SAP RemoteCube is a RemoteCube that allows you to define queries with direct access to transaction data in other SAP systems. Report from BW as a substitute for reporting tools in source systems. Provide real-time access to transaction data in one or more operative systems.Direct access or replication? Use the available BW infrastructure. A RemoteCube allows you to report on data in an R/3 or in a non-SAP system, without having to store the transaction data physically in the BW. For example, you are able to use a RemoteCube to access the external systems of market data providers.This reduces the amount of administration required on the BW side, and the amount of memory space that is required. Replication is still the only option for master data, texts, and hierarchies. Additional requirements to be met by the extraction programs. Selective, the most important characteristics. 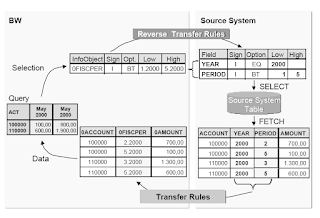 No inversion of customer exits (in SAPI). Available from SAP Source System Release 4.0B. you require very up-to-date data from a SAP source system. you access only small amounts of data infrequently. only a small number of users work with queries on the database at the same time. large amounts of data are requested in the first navigation step in the query and there are no suitable aggregates in the source system. large numbers of users work with the queries simultaneously. you access the same data frequently. The BW-BCT 2.0B component has been installed. The source system is at least a Release 4.0B. In the BW, a source system ID has been created for the source system. DataSources from the source system are assigned to the InfoSource of the SAP RemoteCube. These DataSources are released for direct access, and there are active transfer rules for the combinations. 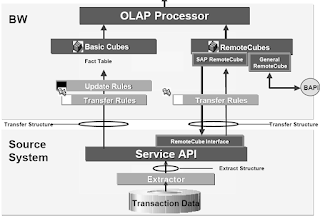 When a query is executed for a RemoteCube, the selection parameters are passed to the OLAP processor which in turn generates inverse transfer rules to convert the selection parameters to a form usable on the OLTP system.Data is selected for the query on the OLTP system.The selected data is transmitted back to BW throught the transfer rules used for the RomoteCube and on to the OLTP processor which presents the results of the query. No data is stored on the BW system. You can create a RemoteCube for Nielsen data, for example. Nielsen data is stored in an external system that provides remote access. This means that you can create queries and data that is accessible remotely, without loading the data onto the BW database. A MultiCube is a higher-level InfoCube that gathers together data from several BasicCubes or several RemoteCubes and puts it into a common context. The MultiCube itself does not contain any data. The data is supplied exclusively by the BasicCubes or RemoteCubes on which the MultiCube is based. SAP recommends that you create MultiCubes based on BasicCubes that have at least one characteristic in common. A MultiCube allows you to report on several BasicCubes or several RemoteCubes.MultiCubes only exist as a definition. The data remains in the BasicCubes.The concept of the MultiCube allows data to be staged faster, because only smaller BasicCubes need to be filled. By combining into a MultiCube the shared characteristics and the different key figures of the BasicCubes, you are able to execute queries on the data that is stored in the fact tables of the BasicCubes.This concept provides you with advanced analysis options, without you having to fill new and extremely large InfoCubes with data. A query for a MultiCube is subdivided into several queries for the corresponding BasicCubes. You can process these queries in parallel. This gives you additional improvements in system performance. 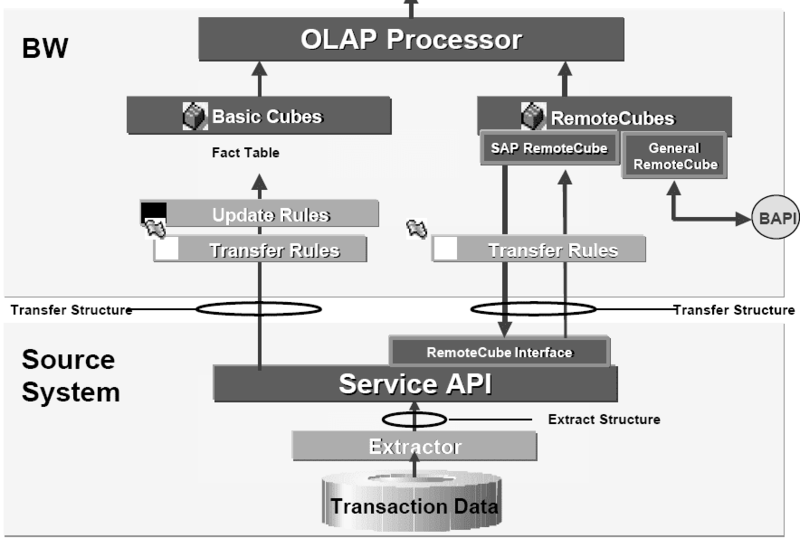 The OLAP processor presents the combination of the single query result set as a MultiCube query result. one of the key figures is present in both InfoCubes? Use the key figure from one of the InfoCubes if the information is intended for the same characteristics. Use the key figure from both InfoCubes if the characteristic values do not overlap. a characteristic in the MultiCube corresponds to both a characteristic and a navigation attribute in one of the BasicCubes? Select one only to use. a characteristic in the MultiCube does NOT correspond to any object in a specific BasicCube? Do not include the characteristic in the MultiCube. It is confusing for users if no values are returned when they request a combination of characteristics. There are certain considerations that you must make to ensure that users are provided with meaningful data.If there are key figures that are common to both InfoCubes, the information that is displayed in the reports can be incorrect.